A layer is an object or group of objects that occupy a particular plane. Layers are often used in graphical editors to create composite images that contain overlapping objects. In BarTender, layers may contain one or more text objects, images, barcodes, shapes, and/or lines to be included on the same plane. Even if the objects on two layers do not directly overlap, each layer will occupy a different plane. 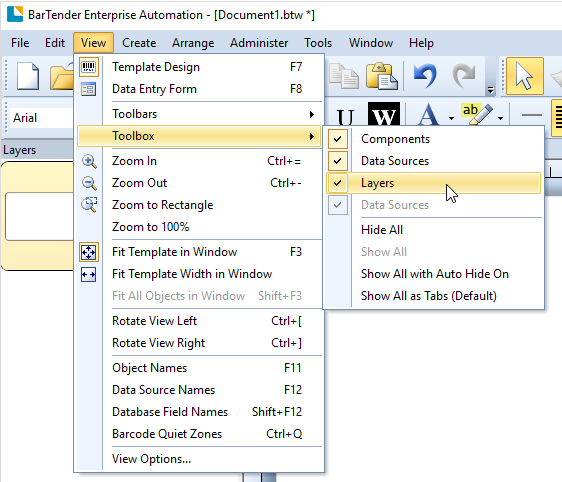 In BarTender, layers are managed primarily through the Layers pane of the Toolbox. This pane is used to create, edit, and maintain layers. Layers can be rearranged using the toolbox buttons or the drag-and-drop method. Layers may also be locked to prevent accidental changes to them. Common use-cases for locking layers include pre-printed layers that represent graphics that are already printed on the page or layers that represent static parts of the template. By locking a layer, you ensure that it is not accidentally moved or re-sized on the template. 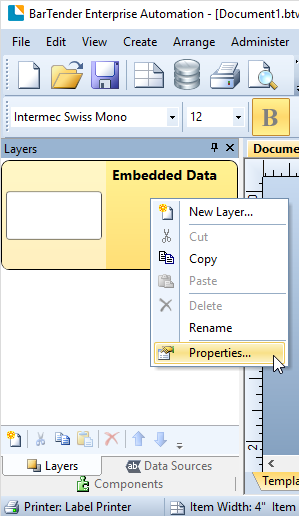 Right click Layer 1 in the Toolbox and rename the layer Embedded Data. You can put all objects with embedded data on this layer for organization. Layers can be given distinctive on-screen appearances to enable you to easily distinguish between them. For example, you can set one layer to display in a single color, while another layer has reduced transparency. In addition to on-screen changes, you can also configure individual layers to print using different print heads. 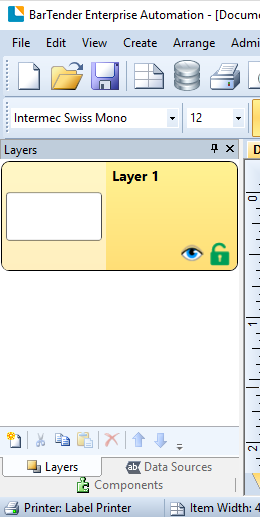 For more information on configuring a layer, see the Layer Properties dialog. Right click the layer and select Properties from the context menu. Alternatively, you can double click the layer. Comments: Provides space for any special information end users might need regarding the layer. The comments will appear in the preview image of the layer in the Layers toolbox. Locked: When enabled, prevents the selection or moving of the objects on the layer. 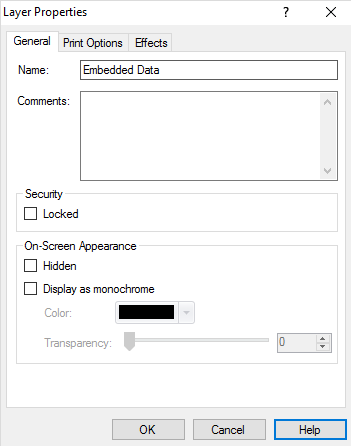 The On-Screen Appearance section contains options for how items in the layer will be displayed on your computer monitor. Any changes to the options in this section will not affect the printed outcome of your document. Hidden: When enabled, hides the layer and all objects on it. Objects in a hidden layer cannot be selected, moved, or seen. Color: Defines the color of the objects on the layer. 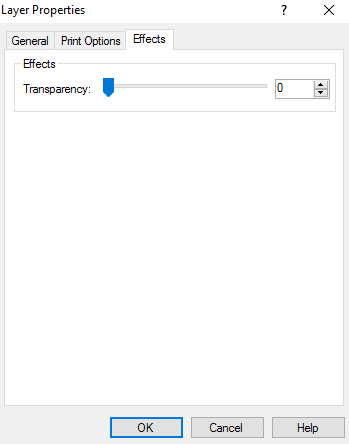 Transparency: Selects the displayed level of transparency of the layer from 0 (opaque) to 100 (completely transparent). Preprinted: When enabled, treats the layer as if it is already printed on the media. 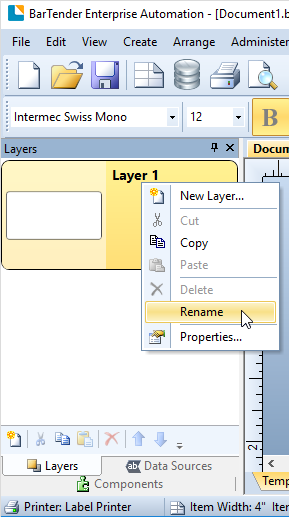 If this option is selected, the layer will not print, though it will appear in the Print Preview window. Print When: Determines when BarTender prints the selected layer. This option is available only when the Preprinted option is disabled. Opens the When to Print dialog, which determines specific conditions for printing the layer. The Bounding Rectangle section allows you to set a boundary in which all objects in the layer must reside. Clip objects to bounding rectangle: When enabled, only layer objects within a rectangle determined by the values in the Left, Top, Width, and Height fields will be printed. If an object resides partially within the bounds, then only the portion within the bounds will be printed. This option can be combined with password-protected layers to limit users to editing only specific regions of the template. For more information on this functionality, please see Layer Security. The Output Panel section allows you to configure your document when printing with alternative panels on a card printer. Layers are grouped by the type of material selected. If the current printer is not capable of using the selected material, BarTender will display a warning icon above the layer, along with an error message. 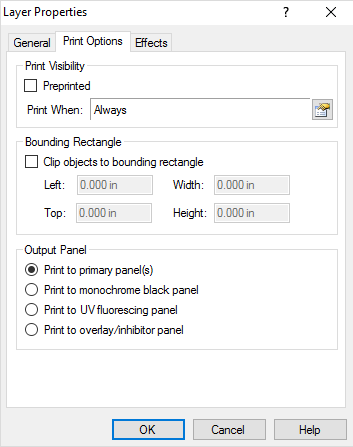 Print to primary panel(s): When enabled, configures the layer to print using the main color panels available on the printer. Print to monochrome black panel: When enabled, configures the layer to print with a monochrome black panel. Layers configured with this option show up in black and white, and are best-suited for text or simple outlines. Print to UV fluorescing panel: When enabled, configures the layer to print onto a UV fluorescing panel. Layers configured with this option will only show up under ultraviolet light. Print to overlay/inhibitor panel: When enabled, configures the layer to print onto an overlay/inhibitor panel. The Effects tab contains options for applying transparencies to all items on the layer. The settings for this transparency applies to all items in the layer, and overrides any individual transparency effects applied to the items on the layer. Transparency ranges from 0 (opaque) to 100 (completely transparent).